Undated photograph of George Fernald and a grey horse. 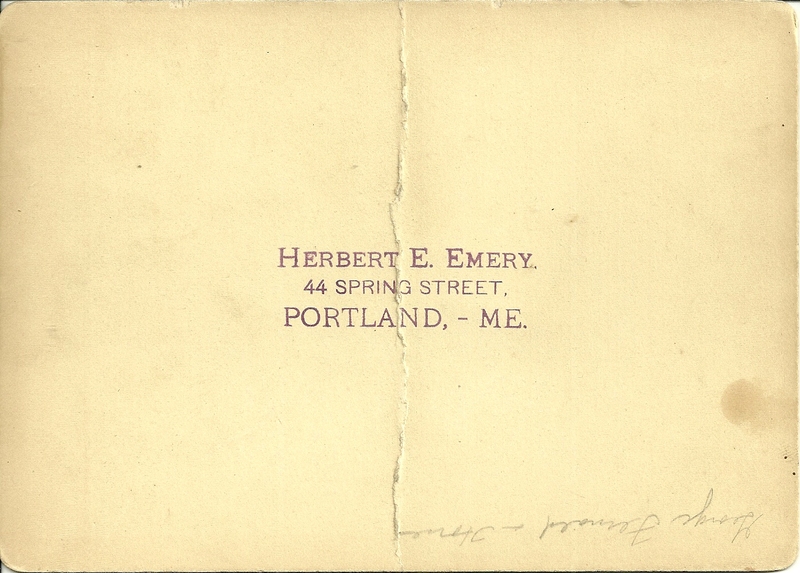 The photograph, appearing to be from the late 19th century, was taken by the studio of Herbert E. Emery of 44 Spring Street in Portland, Maine. 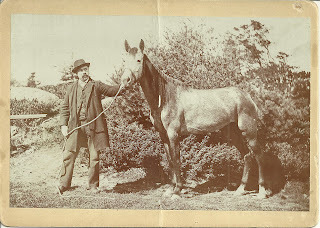 The horse appears to be of quality, though the pose is not an attractive one. I found a George Fernald in the 1880 Census of Portland, with an occupation listed as "teamster". He was living in a household headed by James P. Miller, the father in law of another man in the household named Joseph H. Fernald, also listed as a teamster. Joseph had a son named George M. Fernald, perhaps named after George Fernald, perhaps not. 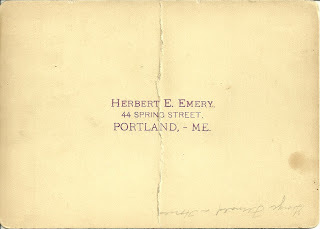 Nathaniel Scribner Fernald, son of Otis Fernald of Harrison, Maine, ran a livery table in Portland for many years in the late 1800s. George may have been a relative of his, but I wasn't able to find a link between Nathaniel, Joseph and/or George, though there could be one. Joseph H. Fernald was born 19 January 1940 in Maine, the son of James Edward Fernald and Ann (Berry) Fernald. His paternal grandparents were Joseph Garrison Fernald and wife Hope (Cobb) Fernald. I don't have information on Ann (Berry) Fernald's parents, or even if Berry was truly her maiden name. Joseph married Elizabeth Helen "Lizzie" Miller, daughter of the aforementioned James Purvis Miller and Eunice (Hamblett) Miller. Despite searching in several areas, I could not link a George Fernald to Joseph H. Fernald. In the 1880 Census, George shows to be a year or so younger than Joseph. In some online trees, I found a younger brother of about the right age, but he was named Augustine S. Fernald. It's possible that George was Joseph's cousin or other relative. If you have a theory about the identity of the George Fernald in the photograph, please leave a comment or contact me directly. Thanks!